Licenses in 3 jurisdictions including New Jersey, USA. Poker clients support Windows, Mac, iOS, and Android. No instant play option on browser. Party Poker (stylized as partypoker) started out as one of the first online poker card rooms back in 2001. At that time, it was one of the brands owned and managed by PartyGaming plc. When the site launched, it boasted of having 80,000 players logged-in and wagering. Thanks to poker’s growing popularity, the brand found itself getting the largest market share of real money online poker players at that time (topping out at 60% in 2003). This helped establish the poker room as one of the largest in the industry up until the Unlawful Internet Gambling Enforcement Act of 2006. When this happened, partypoker decided to withdraw from the U.S. market, leaving the door open for PokerStars to become the online poker traffic leader. 2011 saw the brand rise again with PartyGaming and bwin’s merger resulting in the formation of Bwin.Party Digital Entertainment. Even so, with Black Friday stamping out the entire online casino gaming grey market in the US in 2011 and the European market getting cramped, it seemed like the brand was going to go through hard times yet again. PartyGaming agreed to a $105 million settlement with the U.S. authorities a couple of years back, which made returning to the regulated American market through states like New Jersey a lot easier. They eventually did score a license in NJ through a partnership with Borgata, an Atlantic City casino. With that said, Bwin.Party Digital Entertainment and all its brands (including partypoker) eventually got acquired by GVC Holdings PLC, a company operating out of the Isle of Man, in 2016. Players have a lot of options when it comes to live tournaments sponsored or run by partypoker. The latest of the poker room’s live tournament series’ include MILLIONS World, Caribbean Poker Party, MILLIONS UK 2018, MILLIONS Russia 2018, Sochi Poker Festival – Summer Edition, EAPT Minsk, Grand Prix Mini Galway, Grand Prix Mini Dublin, WSOP Russia, Triton Super High Roller Series, and the Concord Masters V. Other than these, the poker room has also been associated with The 2018 Fitzwilliam Poker Festival, Grand Prix Germany, the Irish Open, the Nordic Poker Championships, EAPT Prague, WSOP Uruguay, Grand Prix Cork, Las Vegas Poker Party, and the Canadian Poker Championships. If players are interested in participating in a partypoker LIVE tournament, they can try qualifying for them online through the poker client. Officially called the Power Series, partypoker’s online tournament schedule’s main draw is its $10 million in guarantees every week. The series has Daily Majors tournaments that players of all levels would have no problems joining. The main tournaments that players can join are Super Sunday, Mix-Max Monday, Big Tuesday, 6-Max Wednesday, Big Thursday, Faster Friday, and Smooth Saturday. In addition to these, the poker room also has tournaments such as Daily PLO, and Ladies Events that are designed to make the grind much more exciting and potentially lucrative. As for how much the buy-ins are, players can easily join these online tournaments for as low as $0.55. Other than these main tournaments, partypoker also has knockout tournaments that feature rake reductions of up to 60%. There are multiple tiers for micro, low, mid, high, and high roller buy-ins. Players who enjoy Mix-Max tournaments can check out the poker room’s Powerfest series, which also features Progressive Knockout tournaments (among others) and offers as much as $3 million in guaranteed prizes. Team partypoker is composed of an impressive who’s who of poker professionals and personalities. Serving as the brand’s chief ambassador, as well as Chairman, arguably the most famous among these would be former longtime WPT commentator, Poker Hall of Famer Mike Sexton. Other professionals that are sponsored (or serve as ambassadors for the brand) include Isaac Haxton, Fedor Holz, Patrick Leonard, Jason Koon, Sam Trickett, Philipp Gruissem, Bertrand “ElkY” Grospellier, Carl Froch, tennis legend Boris Becker, Joao Simao, Richard Dubini, Roberto Romanello, Padraig Parkinson, Anatoly Filatov, Dzmitry Urbanovich, Johnny Lodden, Kristin Bicknell, Jouni Jouhkimainen, Natalia Breviglieri, the “Flying Dutchman” Marcel Luske, Bruno Gagliasso, and Luiza Simao. Other than sponsored pros and brand ambassadors, partypoker also supports a team of online poker players as well. These include Lui Martins, Renato Nomura, Louise Butler, Josip Simunic, Day Kotoviezy, Beata Jambrik, Phillip Karbun, Adam Neal, and Deborah Vanneste. Names like Marvin Rettenmaier, Antanas Guoga (Tony G), Kara Scott, Ian Frazer, Felipe Ramos, and Remy Biechel have also been associated with the brand either as sponsored pros or ambassadors in the past. For players who are new to the poker room, partypoker has a welcome bonus package that they’re bound to take advantage of. The poker room will give players a 100% match bonus on their first deposit that can reach up to $500. Players will only need to deposit at least $10 and they can then get the bonus in 10 increments. In order to get each increment, players will need to accumulate a specific number of loyalty points. To generate 1 loyalty point, the poker room requires players to generate $1 in rake on poker games the platform. The poker room gives players 90 days from their initial deposit to earn all the loyalty points needed to claim all 10 bonus increments. Players should have no problems running the partypoker poker client on their desktops/laptops running Windows. The download size is relatively small. Recently, the poker room released a MAJOR update to their poker client providing much needed QoL (quality of life) improvements for its players. These new features include (but aren’t limited to) a larger and more improved table design, customizable backgrounds and felts, a revamped bet slider, refined table views (for ‘Oval’ and ‘Racetrack’), and perhaps most importantly, improving multi-table support. Also included in the update are changes to the hole card size (it’s now bigger), custom buy-in ranges for multi-table tournaments, and Player Note functionality enhancements. For players who prefer to use their mobile devices, the poker room has apps that are downloadable on both the Google Play and the App Store. It should be noted thought that not all iOS or Android devices might be able to run the mobile apps. Older mobile devices might have problems with some of the newer features that the partypoker apps have. There are also a number poker clients for players on Linux computers but these aren’t officially supported by partypoker. If you are looking to play at the PartyCasino section for casino games, you can get an exclusive bonus from Casino Bonuses Now and use their PartyCasino bonus code here. partypoker has four main sites that are licensed and regulated in different jurisdictions. Partypoker.com is managed by Electraworks Limited and has licenses issued and regulated by both the Gibraltar Gambling Commissioner and the UK Gambling Commission. 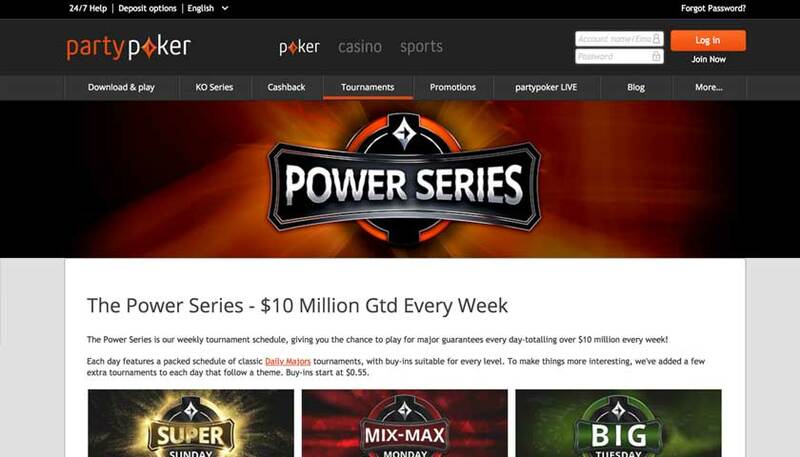 Aside from this site, there’s also partypoker.net which is managed by ISG (Gibraltar) Limited. What makes this site unique is that it doesn’t have (or require) a license to operate owing to the fact that it doesn’t accept real money wagers or buy-ins. 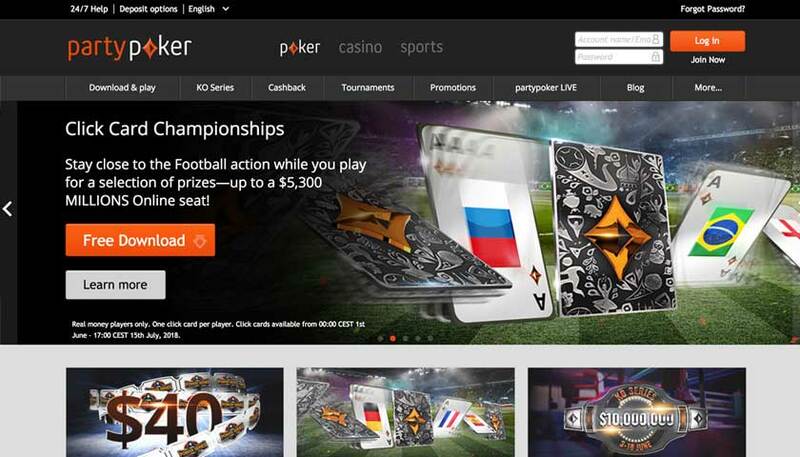 While the main site is supposed to service players from all over the world (or at least those in countries where online gambling isn’t illegal), there are also dedicated partypoker sites for France and Russia. The French site is managed by BES SAS and it has a license to operate issued and regulated by ARJEL (Autorité de régulation des jeux en ligne – the Regulatory Authority for online games). Much like partypoker.net, the brand’s Russian site is also managed by ISG (Gibraltar) Limited and doesn’t accept any real-money wagers. While online poker isn’t allowed throughout the USA, certain states like New Jersey and Nevada have regulated the activity, so players can enjoy this activity within certain state borders. Players in New Jersey should have no problems accessing partypoker owing to the poker room’s license issued and regulated by the New Jersey Division of Gaming Enforcement. More than any other poker room, partypoker has gone through the most ownership changes since it first entered the scene in 2001. First owned by PartyGaming plc, the poker room quickly became one of the top poker rooms in the world. A result of Ruth Parasol and developer Anurag Dikshit’s partnership, the company went on to manage the brand and even turned it into the world’s top poker rooms in under half a decade. Things started to trend downward for the company though when the US Congress passed the UIGEA in 2006. The brand still managed to get licenses to operate in Europe, so it operated in markets that were already congested. Thanks to their exit of the US market, the brand experienced a decline that culminated in a partnership with bwin. This resulted in the formation of Bwin.Party Digital Entertainment, which officially became the brand’s controlling company in 2011. The new company continued to provide players with the same services and even managed to get back to the newly regulated US market in 2013 with an online gaming license obtained in New Jersey. Unfortunately, the return to the US market hasn’t panned out as well as the company had hoped owing to the ring-fenced nature (i.e., limited liquidity) of its New Jersey operations. 2016 saw GVC Holdings PLC buying Bwin.Party Digital Entertainment and all its brands for $1.1 billion. As of this writing, the Isle of Man based company continues to manage the partypoker brand. Question: Does partypoker take US players? Answer: Like PokerStars, partypoker takes US players provided they’re residing (or are located) in New Jersey. The brand has a New Jersey Division of Gaming Enforcement license to operate its services within the state. With that said, the poker room has a couple of additional requirements when it comes to accepting players within the state. In particular, the poker room requires its players from this jurisdiction to be more than 21 years of age instead of 18 as in most markets in which it operates. Answer: Yes, both the mobile and desktop versions of the partypoker client allow for multi-tabling. On the desktop version, players will have a wide range of options that are designed to make multi-tabling a smoother experience. In the wake of the poker client’s (Mac and Windows) MAJOR recent software update, it is now possible to play on up to 12 tables simultaneously. The client supports table stacking, stack personalization, single click session options, custom backgrounds and felts, as well as customizable keyboard shortcuts. In November 2019, they rolled out yet another update to the Windows desktop client with a wide-ranging series of software upgrades based on player feedback. Answer: partypoker has an improved loyalty program that players are sure to take advantage of. Players automatically become members of the multi-tier program by starting out at the Bronze level. As they accumulate loyalty points, players then progress to the Silver, Gold, and the Palladium levels. The loyalty points they’ve accumulated can also be used as buy-ins for the poker room’s Weekly Loyalty Tourneys. Other than allowing them entry to tournaments, accumulating points can also result in the players getting instant prizes (after they reach certain points milestones). Aside from these, active players can also get to enjoy cashbacks on a weekly basis. Depending on how many points they managed to earn in a week, players can get anywhere from 20% to 40% rebates on money they’ve lost. Answer: As with most poker rooms, partypoker’s welcome bonus has a wagering requirement. Unlike with online casinos though, the poker room’s bonus’ wagering requirements are different. First off, the poker room doesn’t release the welcome bonuses to new players outright. Rather, a bonus is given to a player in increments of 10. So instead of needing to wager the amount of the deposit and bonus a set number of times, players will only need to make sure that they fulfill the rake requirements needed to get a loyalty point. When they’ve generated enough loyalty points for the completion of an increment, the poker room will then automatically credit the bonus amount to the players’ account. Question: Can I wager my welcome bonus on casino games or on the sportsbook? Answer: Owing to the difference of the bonuses for partypoker’s casino, sportsbook, and poker sections, players will be unable to use the bonuses they get from one vertical to another.